The freelancer economy is changing and growing. In 2016, over 33% of the American workforce had done freelance work within the confines of their home. As a result, over $1.4 trillion in revenue was made annually by people working in home offices. Whether you’re a virtual worker, an owner of an online business, or you want to create an office space, creating your home office can help you maintain your productivity when household issues and family impedes on your work. That’s why you have to assess your technology needs and find a suitable space beforehand so your home office is compatible with your personal and professional needs. 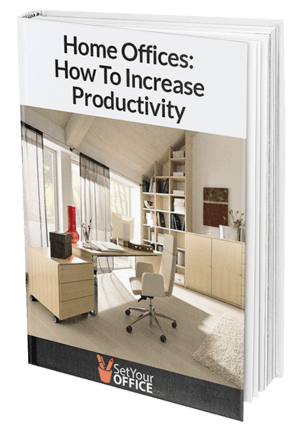 This guide will help you understand the underlying mechanics behind home-based offices so that you can utilize your home office set up. Why Do You Need A Home Office? What Exactly Is A Home Office? What Professions Are Best Suited For Home Offices? What Are Home Office Necessities? What Should You Avoid In Your Home Office? Working at home provides a safe and effective work area that’s always there. And, you’ll save thousands of dollars annually on business maintenance and commuting costs. Thus, you should look into a home office to enhance your productivity. A home office is an office that’s located inside a taxpayer’s home. This office serves as their main place of business and is eligible for tax reductions if conditions are met. For your home office expenses such as mortgage payments and utilities to be deducted, you have to use that area as a primary place for business. This means that you or your employees have to work in that area, or clients have to meet in that home area regularly. Freelancers/Taxpayers who have home offices can deduct a proportion of their rent, property taxes, utilities, and other business-related expenses by dividing the square footage of their office space by the total space of their residence. Then, the fraction is used for all related expenses for a tax deduction. Previously, home offices were viewed as luxury items, but due to today’s economy - filled with corporate downsizings and layoffs - office workers and entrepreneurs decided to conduct their business at home. One benefit of having a home office is the increased housing value. Over 44% of homeowners are willing to pay $1,920 for the extra office room. Here are a few benefits to consider when creating your first home office. Remote workers are more likely to conduct business than traditional office workers.Based on a 2016 American survey,91% of home office workers feel more productive than office workers. Additionally, the same survey showed that home office workers were more satisfied with their job and happier than office workers. And, remote workers make 13.5% more calls than office workers. That equals up to a complete day of work in a regular business week. Home offices are great as they give you an uninterrupted space to conduct your daily business operations. If someone doesn’t want to waste hours in traffic to and from work, a home-based business is a viable option. Suddenly, you’ll have extra hours to have better control over your personal life. While home offices are flexible, you’ll still have to treat it with the same intensity as an office job. There’s no dress code, no boss, and no office politics to exploit. All you need is good time management skills, discipline, and personal drive. Home-based offices run on the principle that the harder one works, the more money they’ll earn. Your performance is directly correlated to your earnings. So, produce more and work harder to receive more profits from your home-based job. Daily commute to a traditional job can be expensive. On average, you’re spending at least $11,000 a year to get to your job alone. However, a home office allows you to cut hidden costs such as registration, fuel, car damage, as well as indirect costs such as the cleaning and maintenance of your expensive professional wardrobe. For an established business or a startup, paying for utilities, rent and other costs lead to a large monthly expense that must be counterbalanced by the revenue. But, a home office can provide multiple tax advantages and deductions. While the tax guidelines are strict, most freelancers can reduce a portion of their maintenance costs, utilities, and can depreciate the section of the home that’s used for an office. (Depreciation can make tax consideration and accounting more complicated when selling your home, so talk to your accountant before planning on depreciating your office space). Home offices have a better atmosphere because they can be easily customized to your personal needs. Working at home eliminates coworker distractions, banter, and unnecessary interruptions. When creating your home office, make sure that it is in an area where you’re least likely to be bothered. Traditional office jobs require your office to be built to their standards. This means that you have no control over the lighting, art, and space in your workstation. On the other hand, home offices have a more relaxing atmosphere making it easier for you to complete your daily projects. Time spent commuting to your job takes a toll on your family time. If you take 20 minutes to commute to your job, you’re losing of 160 quality hours to spend with your family. Having a home office allows you to have your family and home nearby. Everyday situations such as waiting for public transportation or driving in traffic can build up over time. Psychologists found that these scenarios add up and cause mental problems later on in life. Having a home office prevents you from dealing with these common inconveniences. Imagine waking up, drinking coffee, and getting ready to work in a quiet office in your home. Sounds a lot better than driving in traffic, doesn’t it? Over 50% of new businesses fail. If you had to pay for office space and other fixed costs on your first day, a startup failure would cost you more in the long run. Home offices let you test out business practices without too much of overhead. That way, you can test the viability of a business option without investing too much of your capital. Working from home can be fun for a freelancer, but requires a lot of discipline to be done correctly. For managers, working at home requires you to monitor your employees and ensure that they are completing your projects on time. Here are a few disadvantages of working from home and some advice to help you solve those common pitfalls. Sometimes working at home can provide too much comfort. The allure of naps, Netflix, drum lessons, and other distractions are more prevalent at your home office. On some occasions, managers have a problem with monitoring employees performance once they start to work from home. Hire reliable workers and let them loose: You have to hire workers that have a proven track record of completing projects on time. Reward your highest performing workers while re-evaluating the others. If a worker doesn’t fit your requirements of your projects, then you’ll have to fire him. Your home based business is only as good as the workers you hire. Reliability can be a problem for most teams, but without a good manager, things can turn tragic. What happens if you pay your employee in advance, but they don’t turn in the required work? And even if you’ve taken the time to train your employees to become important members of your team, problems can still occur. What happens if your workers disappear without answering your calls or emails? Check your employees. Remote work is a valuable skill that you should check in each potential employees’ resumes. Check for people who have worked in a home office or ran their own home-based business. This is a great indicator of their independence and initiative. Make sure their experience matches the project requirements to increase your employee retention and project completion. Try to document everything. Keep a detailed record of how to complete projects, so that even if your marketing person leaves, you’ll be able to train another employee with videos and documents. We suggest that the documents have the same quality as online video tutorials and keep everything easily navigable and accessible online. Create non-monetary benefits to keep your employees onboard. For instance, some startups provide monthly budgets for exercises and the gym, while others give their employees trips and vacations. The largest difference between distributed teams and co-located teams is the monitoring methods. For instance, you can’t monitor distributed workers in a central physical space. This means that standard performance measurements such as time in and out, are removed. Most traditional office strategies for management will become impossible for remote teams. For instance, you’re unable to gather the team after lunch to discuss project briefings or post-project moterms. Additionally, you’re unable to do walkarounds in an office to see who’s working. Not only is it hard to manage, but keeping your workers accountable is another challenge. With only a virtual presence, it's hard to create ties such as camaraderie and friendship to ensure accountability. Set clear responsibilities for each of your workers and give them a domain of authority when undergoing projects. Being accountable for single tasks means that they’ll work independently with fewer interactions, and it leaves no room for uncertainty since everyone knows what’s expected. Create a culture of transparency. Doing this gives everyone a grasp on their responsibilities and tasks, which increases their accountability and working standards. This can be as simple as keeping your projects viewable to each employee, so they know the overall visions and scope of the company. Optionally, you can create more accountability through public salaries and revenue transparency. Get a time tracking tool to monitor you and your potential employee’s billable hours. This also helps you make sure that your members are don’t become tired due to working overtime. You can use this to see your projects being completed in real time. For freelancers and businesses that hire them for contract them, losing a laptop can be a nightmare. This is a major concern, especially if your business handles large amounts of sensitive data. This also means that information can easily be lost when shared with a remote team. When you place something online, even if it’s public, it’s hard to take it back. With so many threats to your home office’s and business’ security, it's best that you protect it via data encryption, verified payment methods, and higher quality workers. Get a VPN. Having a virtual private network protects your home office from online data attacks. Also, it gives you secure access to a computer via the internet. Basically, VPNs create a private network over public ones such as the internet. VPNs are excellent for keeping your data and files secure, but also accessible to your remote team. Install encryption based software and apps. This protects your data when working in your home office and with your employees. For instance, if your worker goes MIA, you can delete the data and prevent them from compromising or destroying it. Make sure that you paid or provided the device that your remote employees or using. Keep your antivirus system updated. In fact, you only need one antivirus software to protect your data. While installing multiple antivirus software is better than one, chances are they’ll interfere with each other. Keep one good provider, run frequent scans, and keep the antivirus software updated. Also, turn the browsing protection on so you can work safely online. Communication with a remote team is a different field. Each question and answer is well documented on remote teams, but this information can be bulky and takes time for to sort through it. People who work at home offices have to balance multiple communication streams. There’s video call software, instant messaging apps, emails, and project management tools. With so many channels involved, it makes sense why managers are worried about closing the communication gaps with their workers. Host virtual meetings, even with staff members in your location. There is a multitude of benefits to this method such as recording the entire meeting for future reference. Look into communication structures. Despite the extra expenses of virtual insurance, software, VPNs, etc., companies can save a lot by getting a communication structure for their home office. No office supplies, rentals, or electricity bills are included. Create a good online communication ecosystem to keep you, your employees, and your business on board. Due to the growth of freelance work, some occupations can work 100% remotely. Here are the most common professions that are best for home offices. Working at home gives IT developers the ability to create a workplace that suits them. Traditional office environments tend to give their developers only one computer for their products. However, there are some advanced developers who need multiple monitors to conduct their work. IT developers are perfect for home offices as they can create their own computer set up. This allows you to get your own desired operating system (Mac, Windows, Linux), require processing speed, and customized apps to code faster than you would at a co-located office. Writing in your home office is more relaxing than regular office spaces. Since your job is 80% typing and 20% research, there’s no need to commute long hours to a central workplace. Home offices are perfect for writers as it gives them a quiet, yet inspiring space to create masterpieces when writing. Having a dedicated room in your house for freelance writing allows you to use the rest of your living space as a break room. Work as much as you can in your office, but remember to take non-work related meal breaks, call your friends, or do exercises in your living room. You don’t have to be a remote manager or freelancer to appreciate the freedom from working at home. A home office allows you to be in proximity to care for your friends and family, but also complete writing projects once you shut the door. Without a dedicated home office, you’re at risk of constantly becoming distracted by your family members - and always seconds away from sitting down to get your work done. For writers, have a home office that allows you to complete your work while directing attention to family matters when necessary. Other jobs such as data analysts and graphic designers are great for home offices. In office settings, these jobs are limited by the technology and the amount of privacy the company provides. When doing an online job, try to create your home office to follow the job requirements. For instance, if you’re mainly doing designing gigs, invest in a laptop and a tablet that allows you to illustrate your drawings faster. No matter what online job you’re hired or applied for, you’ll be able to leave your work behind in your home office. If you find yourself becoming stressed out by the over work matters by the end of the day, create a home office to create a clear and productive working environment. For architects, working at home gives you unlimited inspiration. For example, you can take a quick walk around your neighborhood and become inspired by the buildings in your area. Home offices give you the chance to receive inspiration and use it on your ongoing projects. When creating a home office, make sure that your computer has the required software for the task (Ex: AutoCAD, 3DS Max, Maya, etc.). Doing this allows you to make an office that increases your productivity and makes you more efficient once creating, remodeling, or creating a blueprint for new architecture. People who are fluent in more than one language can benefit from a home office set up. It gives them a productive area to translate video and audio documents. Usually, these translators will transcribe the documents and include their cultural differences for a more authentic result. For translators, you’ll need a home office with good recording software and hardware. This helps you translate documents more accurately and fluently. Home offices are great for translators as it gives you a relaxing environment to transcribe different languages. When creating your home office, there are a few key things that you need. There are two expected outcomes that can happen when making a home office. Either you’ll struggle to find your equipment, which makes it difficult to get your office up and running. Or you can find every desired item that you’ll need, but become overwhelmed by meeting every need down to the smallest staple. In both cases you’ll find yourself running around in circles before creating a home office that helps you work productively. Use this section to find the necessities that every freelancer should have in their home office. This will give you a streamlined and well-rounded list of what furniture and lighting you’ll need to buy. Check the items you need and circle the ones that make a perfect addition to your home office. In a world where computers directly impact our quality of life, the average person will spend a great portion of time on an office chair. Office chairs are an integral part of your life, and you’ll need to make sure that the chair works with your shape and body size. Does the chair need to have arms? Is the chair’s back high enough to support my back? Does the chair have lumbar support for my lower back? Do I need a chair that has a wheeled base? Does the seat height allow my feet to stay on the floor? Start by researching the chair’s dimensions first. When sitting on a chair, you want your feet to remain planted on the ground. This means that you’ll want a chair that ranges between 16 to 24 inches away from the floor. 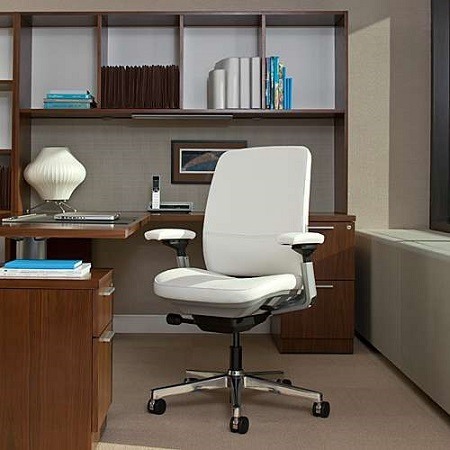 Most office chairs have adjustable settings so you can you adjust the height of your chair within that range. To avoid spinal discomfort, you need an office chair with lumbar support. Unsure what lumbar support looks like? When your office chair curves inward towards the bottom of the chair, that’s lumbar support. Lumbar support helps conform the shape of your lower back so you can work comfortably. If you ever encounter sweat when working, you’ll want a chair back that’s breathable. This means that instead of the back being a single piece, the chair will have holes strategically placed on the back where air can escape. If you don't know what chair to buy, look at our buying guide. We'll help you find a chair that's comfortable enough to get you working on your projects immediately. Ideally, you need space for a traditional desk to make an ergonomically acceptable workstation. But if you’re writing or doing creative work, you need a flat surface table or counter. We suggest that you buy a desk based on your preferences to maximize your productivity. If you’re working 9-5, five days a week in a home office, you have to make sure that it's in a prime location and you’re not wasting space. Comfort is important, so make sure that your desk is not tightly squeezed inside the closet when you can use the guest room that rarely houses visitors. But, if you don’t have space in your home, then choose the location of your house so you can work productively. If you’re easily distracted, then having a desk in the kitchen isn’t a good idea. An alternative option is to create a studio in your garden if you have a lot of outside space. Or extend your office space or make an additional mezzanine level if your home has high ceilings. For extra clarification, look into our buying guide to find the best office desk for your home office. We invite you to check out our buying guide. We’ll thoroughly discuss the best office desks in the market that is ergonomically designed for comfort. Give it a look if you’re still confused on what to buy or you’re in need of a good chair for your workplace. Your PC (Personal Computer) is the lifeblood of your home office. This gives you the ability to connect to the internet and start working. The key to using and leveraging information to your advantage is by buying the right software and computers for your business. You’ll also want to find software that helps you back up business data. There are multiple online services available that will save you money on investing in reliable and secure on-site equipment for your office. If your laptop or desktop is the lifeblood of your business, then the internet connection is the veins. If you're at home business requires you to stream videos, send large files, or make video teleconferences, then a fast internet connection is necessary. You’ll want to ensure that all of your phones, tablets, printers, and computers can enter your internet connection. Test each room in your house to ensure that your connection reaches everywhere; if not, then get a range extender for a better connection. Also, a good WiFi connection lets you work in any area in your house. Whether it’s in your garden, poolside, on your back porch, and frees you from working inside one office area. Research which Internet providers give the best WiFi reception in your area to aid you in working remotely. Lastly, security is important when finding a good internet connection. A good security system protects your business information and private financial documents from your clients. We recommend that you have the best online security for your business, and upgrade and test it regularly. If possible, get a multi functional printer. Why? Because most of us don’t need advanced faxing features or a high-resolution printer to conduct daily business. Having one printer that scans, faxes, prints, and is a great money and space saver. While you can opt for a paperless option, almost every office runs on a printer. Almost every form of business documents needs to be printed, whether the business is apart of a service or product oriented industry. Common examples of office documents include flyers, invoices, letters, and packing slips. Printers can be used to create documents containing scanned images and digital information. And, they can be used to send electronic documents to paper. Get a multifunctional printer to keep your office documents organized and sent to your clients when requested. Most data storages are either physical (external hard drive) or cloud-based (stored by a different company such as Google Drive or Dropbox), a NAS drive is a hybrid between the two. Basically, NAS devices are hard storage devices that are connected to a network. Unlike regular external hard drives, NAS systems have a built-in operating system that has software functions such as remote access, or native media streaming. Other than that, they are similar to any external hard drive that you’ll use. Cloud storage is so convenient that almost every business uses it. But, a NAS backup provides your personal cloud storage that only you and your team can view. Getting a NAS backup for your data prevents hackers from snooping around and destroying your saved files. Most NAS devices have options that allow you to have remote access (i.e., access beyond the local network) so you can send and download your files at any location. Basically, you’ll have your own private cloud storage. If this is one of your main reasons to switch to NAS, then when you’re searching for one make sure that it has mobile apps for a complete cloud storage experience. Lighting is another main component of any home office. Studies show that 70% of office workers have inadequate lighting. Also, lighting is tied to your productivity and mood as well. So it’s recommended to get some good lighting in your home office. For the office itself, try to get a room with natural lighting. Sunlight allows you to maintain your energy and mood through your work. There are two types of lighting for home offices: task lighting and central lighting. Task lighting is flexible and can be directed to any area of focus. For example, a spotlight is a form of task lighting that places emphasis on your work when completing a task. Task lighting is useful when you have to read from other light sources than your computer screen. But, it’s important that you have an adjustable desk lamp because having too much light will affect your eyesight. Central lighting is used to illuminate an entire room or office space. Ambient light comes from natural and artificial sources. Natural sources can be daylight coming through the window while artificial sources are considered to be light bulbs. You can also get indirect lighting for your home office. This form of lighting is used for decoration purposes and can provide additional lighting in your room. Depending on the dimensions and the design of your home, you can find the right lamp for your office. Nevertheless, you should use indirect lighting after you’ve found your central and task lighting for your workstation. Look into our buying guide to find the best lighting for your workspace. We’ll help you find the best central and task lighting on the market to help boost your productivity. Identify theft is a growing concern and problem in the United States. One of the most common ways thieves reach out financial information is by searching through our trash. Buying a cross-cut shredder can make stealing your personal and office documents virtually impossible. For small businesses that create less material, a smaller model is better suited for you. Whatever shredder you decide, make you maintain the discipline and awareness to use it and stop papers with sensitive information from becoming stolen by identity thieves. While your home office should be comfortable, too much comfort can lead to lower productivity and prevent you from crossing off tasks on your to-do list. Painting walls with an extremely bold color can deter you from working in your home office. Paint color and comfort aren’t the only things you’ll have to consider when rearranging or planning a home office. Here are some office mistakes that you can avoid to create an enjoyable working space. This is a common mistake that most freelancers tend to make, but it has a multitude of consequences. If your office is too cocoon-like and comfortable, it rarely encourages you to focus and get work done. In fact, too much comfort encourages the opposite. You’ll find yourself constantly taking naps but not efficiently working on the task at hand. We could all benefit from a comfortable space, but it’s not the right setting for your home office. You don’t have to turn your office into a complete, drone-like work chamber. But you should cut back on comfy accessories that will make you lazy and distract you. If there are additional pillows on your chair or couch, remove them. Plan on buying a stand up convertible desk. Don’t forget to use wooden chairs to make you stand up and walk around after each break so to regulate your body’s blood flow. If you didn’t place much thought into the color scheme of your office, you’ve probably regretted your previous choices and start planning on something new. Painting a home office in a new color scheme is expensive and time-consuming, so make sure you can live with the color scheme for a while. Be thorough during the color selection process. Compare colors that you like and the qualities they remind you of. If you’re getting paint colors, then imagine being surrounded by that color and determine if its the right choice for an office space you’ll spend most of your time in. Here’s a rule of thumb, go two shades lighter than your original color to ensure that the colors fit with your workplace. Anything that makes your home office more constricted and smaller is a problem. One of the largest home office mistakes is to buy an excessive amount of furniture that takes too much floor space. Another thing is window treatments and dark colors that visually lowers the size of the room. To avoid having a cluttered home office, get furniture that takes up less floor space and stands tall (vertical storage). We recommend opting for light colors instead of darker ones in small office areas. Keep your blinds and curtains open to visually widen the space. Now that you know the essentials, you still have to take care of your office. These are the following guidelines you should consider to make your home office a productive and healthy working environment. How Often Should You Clean Your Home Office? Clean your office daily to reduce clutter on your desk and free space on your laptop. Spend at least 3-5 days doing maintenance to keep your office in good condition. Regularly clean common areas with disinfecting wipes and sprays. Most of your hard floors and carpets should be cleaned weekly. If your office receives constant traffic, then you’ll have to clean it more often. We suggest thoroughly cleaning your hard floors and carpets at least twice a year to reduce the amount of germs and keep them in good condition. Having your home office is only half the battle. You have to design it correctly so that you can maximize your productivity. Keep your office clean, prevent distractions, and use it solely for working and you’ll notice more clients and more income. Do you have any questions or experiences making your own home office?